Milan finally drew blood on our home pitch, at the expense of Cagliari. With Allegri up in the stands, two other players banned, and our usual injury parade, this was actually quite the feat. After more media coverage lately than we’d had in years and the accompanying grief that goes with it, we needed the win even more than the three points. Maybe the reason we finally broke the curse is because while Inter have Faraoni, we have the one true Il Faraone. He certainly seemed legitimately regal tonight. The curse is broken! The Little Pharoah breaks the curse! 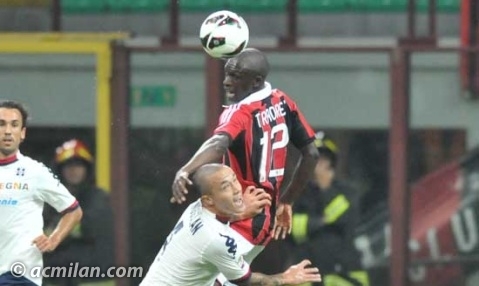 The first half, Milan came out fighting…. literally to the point that Pisano and De Jong both got yellow cards in the first 12 minutes. But out of the scrappy play, Cagliari made a crucial defensive error that sent El Shaarawy alone into the box, with Montolivo feeding him the perfect ball, and in the one v one with the keeper, El Shaarawy’s shot won. Milan 1-0. Pisano went down in the box in the 33rd, looking to De Marco to give him a penalty, but this ref was too clever for that. Traoré made little to no contact, it was not a penalty. I liked De Marco, as he gave verbal warnings to the players instead of handing out cards like candy. Although Pinilla did force his hand and earn a caution in the 36th for a bad foul on Abate. Shots were traded back and forth. By the end of the game, Milan only just edged out Cagliari in possession, with 51% and both sides had a comparable number of shots. Pazzini, El Shaarawy, and others took their chances, but they were often just wide. In the 40th, an Astori massive error saw him pass it to Urby (maybe it was a Rossoneri flashback?) who took the gift of an opportunity and sent it into orbit. Ouch. Then in the 42nd, on a beautiful shot from distance, El Shaarawy’s ball was just deflected enough by Astori to hit the cross bar instead of the back of the net, Pazzini managed to get a head on the rebound, but it, too was blocked… by Astori. Guess he had to make up for that pass to Urby. What impressed me about the first half is that everyone was making contributions. It’s amazing to see the guys learning to work together. And to be honest, Traoré starting frightened me, as what we saw preseason was a lot of reckless tackles and careless mistakes. But I was more impressed with him tonight. He’s not going to be nominated for any awards any time soon, but in a Budget Milan™ squad like this, he’s a good bench player. This lineup was like when all of the cogs fall into place and they start turning, and surprisingly so. Of course, bringing De Sciglio on for our other left back options is something every Milan fan wants to see, so that was another important piece. Again, we started out trading shots. Our players might be a little better at Sky Jousting than Cagliari, but then again our finishing was much better.Tassotti made his first sub in the 54th minute (I wonder if Allegri wet himself?) by taking off Traoré and bringing on Constant. Shots traded, another big save for Abbiati in the 58th, and then things started turning ugly. Pazzini and Conti were mixing it up, Pazzini may have gotten the best of Conti here, but the ref was having none of it. Both yellow cards in the 63rd. But that was not to be the end of it, not 3 minutes later, Conti elbowed Pazzini. Second yellow. Bye bye. Cagliari down to 10 men. Of course, just before this, in the 65th, Robinho came on for Urby fresh off of the injury list. Urby played better tonight than he has in the past game or two, but I’m not sure Allegri has found his best spot. De Sciglio, who is one tough almost 20 year-old, not to be left out of the cautions, earned himself a yellow in the 71st. 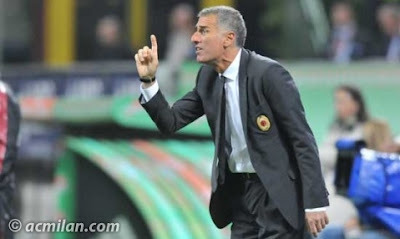 Then Tassotti used his final sub in the 76th, Ambrosini came on for Montolivo. 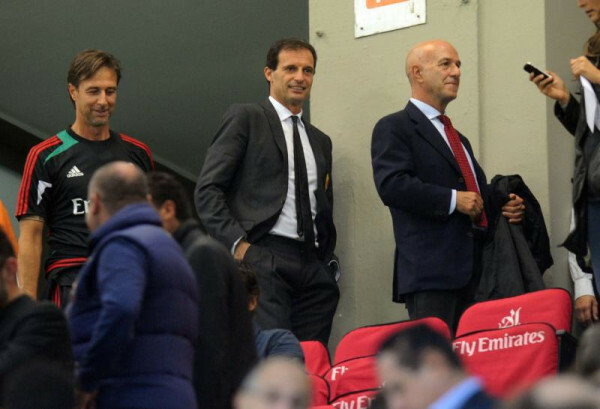 (Do you think they hid the game clock from Allegri so he wouldn’t notice the early subs?) Montolivo also did better tonight, but this was a good sub. Milan were starting to turn the tide now with Cagliari down a man for almost 30 minutes. Some sky jousting and an almost from Robinho, but in the 82nd is when magic happened. 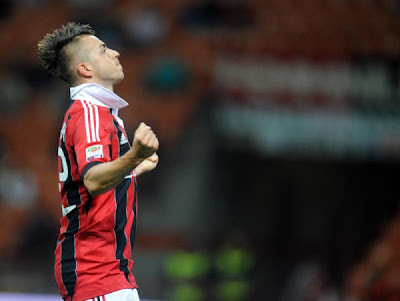 El Shaarawy scored his 2nd on the night with a great assist from Ambrosini, who is nearly old enough to be his father. 2-0 Milan. The last 10 minutes or so were more of the same, with more balls put into orbit by both teams than satellites already in orbit. But Milan got the win. At home. The curse is broken! Again, I saw lots of improvement tonight. I’m not saying we are anything near the team Milan have been the last two years. This is still Budget Milan™. But the squad showed better cooperation and understanding, and it seems like this 4-3-3 formation is here to stay. Don’t say we won because Allegri was not on the sidelines, that’s ridiculous. That would be like saying all of Carrera’s wins have nothing to do with Conte. And in fact, El Shaarawy said this win was for Allegri. But this win should be credited to the players, who have had to endure a ridiculous amount of scrutiny and criticism even from their own fans. The Curva supported them in full song for 90 minutes, so maybe there is something to this idea that if we all stand behind them, they will succeed. Certainly supporting them is a lot easier with a win. And even though it was only a midtable team, I’ll take it. The curse is broken!